Let me begin by saying Thanks to all of you, to those who have traveled to join us tonight and to those volunteers who were unable to make it tonight. We all made this journey for a reason. It was an honour, a humbling and inspiring experience to be your candidate, but in my heart I know we came together because you believe in what this country can be. You believe in hope, you believe that we can be one people, that we can do better. That’s the journey we’ve been on, and are on together. Tonight we break bread together, share laughter and stories, friendships, and we’re going to have some fun too! The 2015 federal ballot was a very high stakes election. Stephen Harper’s Conservatives engaged in cynical politics, wedge politics, and made it the most mean-spirited and racist election campaign in memory. Voter turnout confirmed that Canadians wanted change. According to Ekos research, almost 1/3 of voters decided which party to support only in the final week – a third of them only on Election Day. Overwhelmingly, Trudeau’s Liberals emerged as the safest and traditional route to achieving Harper’s defeat. Locally, we did so much right, yet we fell short of votes. We ran a strong and positive campaign, it was the envy of many a campaign, a “model campaign”. 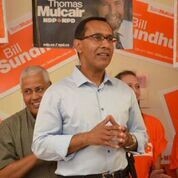 I received a call from Tom Mulcair commending us for our campaign and commitment to work for a better Canada. I conveyed how inspired and honoured I was by the dedication and passion of hundreds of volunteers that worked on the campaign. 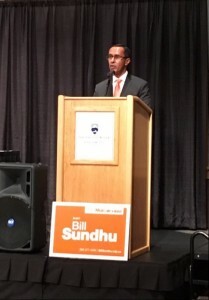 We demonstrated the most inclusive campaign and strength of diversity ever seen in this region. The campaign staff coordinated a campaign that was well-run: we knocked on at over 22,000 doors (5,872 on one day alone) through two seasons (in heat, wind and rain), had to order signs three times, phoned tens of thousands, fundraised impressively, cleaned and cooked to keep the office running, and we shared a passion for change that matters. We hosted a fantastic rally with Tom Mulcair that few of us will ever forget. We engaged so many people on a personal level, from the heart and soul. Its hard to imagine that we could have done anything more. We did get rid of Harper and I believe Tom Mulcair and the NDP did the heavy lifting nationally to make that happen. 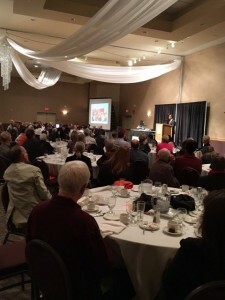 We were well positioned to win in Kamloops-Thompson-Cariboo had it not been for the Trudeau “wave”. Our message of hope, optimism, generosity and caring does not fade away. I am touched by your commitment and wish deeply that we could have rewarded your very hard work, passion, and endless drive for victory into more votes. We will analyze the national and local campaign and build on your good work to further strengthen us for next time. I urge first time volunteers to join us and remain actively involved in working for a common vision of a fairer and better future. I saw the tremendous potential of new leaders and great campaigners emerging through the experience of this election. This campaign was the vehicle of your hopes, and your dreams…about reclaiming the meaning of citizenship, restoring our sense of common purpose. We want to win that next battle – for better schools, and better jobs, and better health care…to confront a growing inequality, to address an overheating planet, for a democracy fed by justice and opportunity…of how we see ourselves as citizens, how minorities are treated, how we think of immigrants and refugees, how we look after each other, how we imagine ourselves as a people…a society structured so that people can make life better for one another. The country feels liberated. The new government is committed to change. We must work with it to make things better – for change – and to hold it to account for its many promises and contradictions. There are those among us who bear many wounds. There will still be days of struggle and heartache. But, the rains will come and the winds will still blow. We have the gift of hope, to leave our children – all our children – and grandchildren – a better world. Even, if its difficult. Especially, if its difficult. That’s our hope, for our country in the years ahead. Thank you. It’s my honour to be with you tonight.